If a person is a member of 2 or more groups, the members of all of the groups together are considered to be 1 large group for payroll tax purposes. Orange Pty Ltd and Black Pty Ltd are grouped. 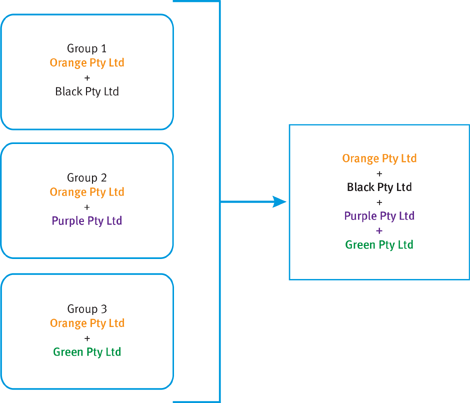 Orange Pty Ltd is also grouped with Purple Pty Ltd, and separately grouped with Green Pty Ltd.
As Orange Pty Ltd is a common member of each of the smaller groups, the 3 groups are combined to form 1 large group. If 2 or more members of a group together have a controlling interest in a business, the business and all the members of the group form 1 large group. Blue Pty Ltd and Red Pty Ltd are grouped. Blue Pty Ltd has a 40% interest in a partnership. 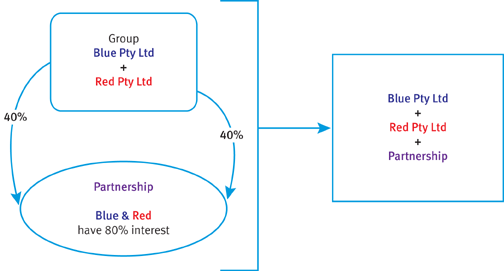 Red Pty Ltd has a 40% interest in the same partnership. Blue Pty Ltd and Red Pty Ltd together have an 80% interest in the partnership. Blue Pty Ltd, Red Pty Ltd and the partnership therefore form 1 large group.